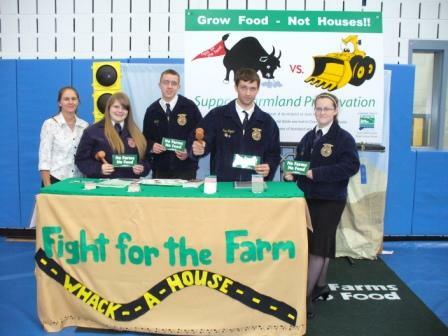 ‘Fight for the Farm’ – Whack-a-House! A creative project put together by a talented team of students provides an educational experience that comes with a satisfying THWACK! 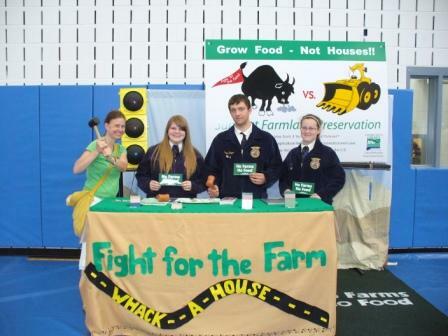 Four Future Farmers of America from Connecticut’s Southington High School Agriculture Science & Technology Center are taking their ‘Fight for the Farm’ booth featuring Whack-a-House to the National FFA Convention in October 2010 in Indianapolis, IN where they will represent Connecticut. Congratulations team! This is great. It’s so good to see that these young people “get it”…that farmland is a finite resource, and that our development policies need to treat it as the important, life-giving and economic resource that it is. In my work as a land use planner, I’ve found that farmers are sometimes the worst enemy of farmland preservation, as they don’t want to give up their option (viewed as a God-given property owner right) to create a rural subdivision. We need more people who are forward thinking about the ability to continue farming the land. I must have missed a description of that ‘fight for the farm’ is…details please…or where to click to read more. The more vocal the better and this is a start. But there are power in numbers. As with a co-op, where people work together to get the job done, can the voices of the farmers, not be brought to the airwaves in greaty magnatudes. In the sixties and seventies, the people rose up and complained and we got the Clean Air Act, The Clean Water Act, so on & so on. I applaud these kids, people need to rise up and make their voices heard. Before we lose our most precious commodity; the farmers and the land they hold dear. But Please do give more details of the program. Inquiring minds want to know. Some folks are newbys to this mission and will learn a great deal and hopefully get fired up and involved in local development oversight for their own communities. I love what I have read so far. It is always inspiring to hear about young people advocating for farms! Where can we learn more?? Links? Contact info?